By Alon Fliess, The Internet of Things (IoT) brings together devices, sensors, cloud, data and your imagination. 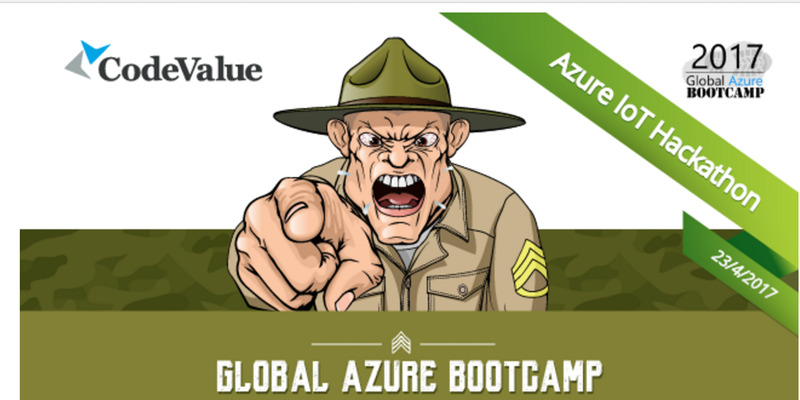 Join the global Azure community and take part in this Azure Boot camp hackathon event. Come, learn and create an IoT device, connect it to Azure IoT hub and form an IoT system. Whether this will be your first experience with the Internet of Things or you’re a seasoned pro, you will experience tools and technologies that get you going in Internet of Things (IoT)! 09:00-09:45 – Introduction to the internet of things, IoT devices 101. 09:45-10:30 – Azure IoT – IoT Hub, Device SDK, Device Management & Communication. Azure Service Fabric represents a revolution in the way we can host and manage our applications both on premise and in the cloud. On the one hand, with its generic hosting capabilities, Azure Service Fabric can be used to reliably host any application in the cloud. On the other hand, and using its varied programming model we can easily author, host and manage a micro-services based application with a mixture of reliable services and actors. In addition, support for reliable, scalable stateful services truly represents a breakthrough in the way we model our apps and store their data. OpenCV Node js Bindings - Background Subtraction Demo - on Raspberry PI ! Finally, the arm build is working, some of the problems I had to overcome, well? waiting for Raspberry PI to compile, why this computer is so popular when RK3288 is available I will never know. I've ordered a few RK3288 to accelerate my work on arm, meanwhile I think my RK3188 will be faster, I'll update as soon as I can. Another problem is some issues I've had with file names, while working on the linux port, the typescript import file names were case insensitive and this time they were. Lastly, different version of gcc than the linux test machine, so c++14 wasn't the default, I've added it to the build, hopefully there won't be any issues now. In any case, this demo is for background subtraction, on arm, about 3-4 fps for two background subtraction algorithms, CPU is about 25-30%, mostly single core, in the video its higher because ffmpeg attempts to capture and compress the screen capture in the background, the x11 took some more CPU. Not bad but if you're planning to run OpenCV on Raspberry PI, you'll probably need to do some serious optimizations by resizing or changing algorithm parameters.